Working on the roof is perhaps one of the most dangerous building repairs. From the height to the dangerous equipment being used, roofing requires understanding and implementing safety precautions. Whether you are a seasoned roofing contractor or someone with very little experience, consider the following tips for optimal roof safety. Many materials are being used when you are working on a roof. Pieces of debris, tools, and other equipment can be a potential trip-and-fall hazard. When working on a roof, begin by clearing away unnecessary items. If you are proactive in keeping your area of work free of clutter, it will be much easier and safer to move around. Roof safety is not just about protecting yourself against a fall. In the summertime, the temperatures can rise to triple digits without a problem. Working in extreme conditions like this poses a greater risk of heat stroke and dehydration. It is important to take frequent breaks, even as often as every 15 minutes. Educate whoever is working on the roof about possible signs of heat-related risks. One way to be safe against the heat is to begin working early in the morning before the hottest time of the day occurs. The hottest time of the day with the most sun exposure is between 10 a.m. and 2 p.m. While it might not be possible to avoid working during this time, you should be aware of the dangers. 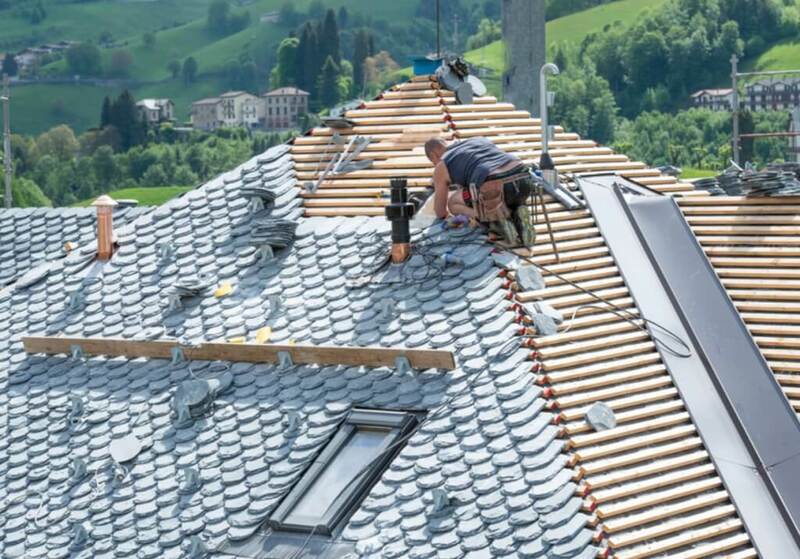 Even if you take all the proper roof safety precautions, you still need to consider a harness. Many times the roof will have an extremely steep pitch, and it is difficult for a worker to get traction. The harness will give you the extra protection you need. Proper ladder safety is equally important. Before you begin working you should double check to make sure that the ladder is placed on a sturdy surface. Make sure you position the ladder, so it is a little bit over the roof as you begin to climb. It is always a good idea to use a buddy system when ascending and descending a ladder. If you’re injured while working on a roof, try not to move. Wait for emergency services to arrive. This is just one of the reasons why you should never work on a roof alone. In the event of a fall, you would have no one to call an ambulance or administer CPR. If you’re injured while on the job, a witness will ensure that you receive the compensation you’re entitled to in case your workers’ compensation or personal injury claim is ever in dispute. Roofing repairs or replacements are dangerous. It’s always better to leave these projects to professionals. When your roof is in need of maintenance, trust Slate & Slate Roofing to get the job done right, safe, and on time. Josh is the Director of Technology for Slate & Slate Roofing, and has been involved with the company since he roofed as a summer job while he was in high school.